For more than 35 years, Tellurian has dedicated itself to providing a safe and nurturing environment for those afflicted with addictive disorders and mental illness. Tellurian’s ongoing mission is to meet the needs of those in search of assistance; making recovery possible for all who seek help, regardless of ability to pay. Serving over 9000 people annually, Tellurian relies on the generosity of community support to be able to provide their services. 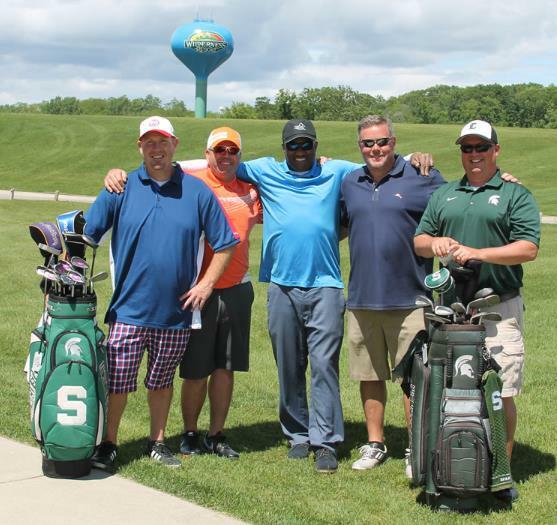 The Annual Tellurian Celebrity Golf Tournament, hosted by Green Bay Packer Hall of Fame, Wide Receiver Antonio Freeman, is the main fundraiser for Tellurian. This year Antonio’s teammates from Super Bowl XXXI joined him in helping to raise funds! This tournament provides funds necessary to allow Tellurian to continue to serve those in need, enabling them to return to their families and community as productive members of society. Complete Mobile Dentistry, Inc. was once again a major contributor; both in time and money. CMD, along with Dental City, sponsored two golf teams. “We definitely topped our revenue from last year by $12,000 for a total revenue of $134,000” Kim Murray, CMD Operations Manager, “That’s a record for this event.” Proceeds from this event will help Tellurian continue their mission of providing drug/alcohol treatment to those who need it, regardless of their ability to pay.